Greenstuff™ 7000 series are a slightly harder pad than its 6000 series stable mate and designed to Reduce Dust and last slightly longer than the 6000 series. Again a great pad and a quality pad replacement for Truck and SUV (4 x 4). 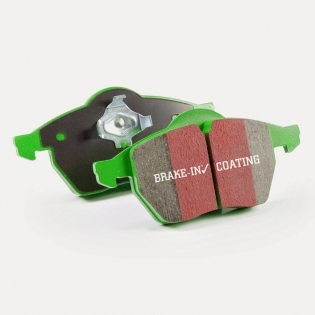 For a small price premium over the 6000 series, these pads are the ultimate SUV / 4×4 front end pad. They will stop faster and last longer with almost zero brake dust and are EBC’s premium offering for heavy 4x4s. These pads are guaranteed noise free. Average friction coefficient 0.45mm. Features and benefits include chamfers and slots, shimmed, and coated with EBC’s own Brake-In friction accelerator for fast bed-in.